Last Easter I was busy packing all of our belongings into cardboard boxes as we prepared to make the life changing move out of London. Our new destination was Kent, where I grew up and where my Mum and brother still live. We had only been in one week when we packed more bags and set off up to Cheshire to see my in-laws for the Easter weekend. Something we do most years. At the time it seemed crazy after just moving house, but once we got there it was lovely to relax, have meals made for us and not unpack any boxes. The weather was fantastic and on Easter day we were spoilt with an Easter egg hunt and plenty of chocolate. This year without having to plan for a house move, I have been able to try making one of my most favourite things ever…hot cross buns. 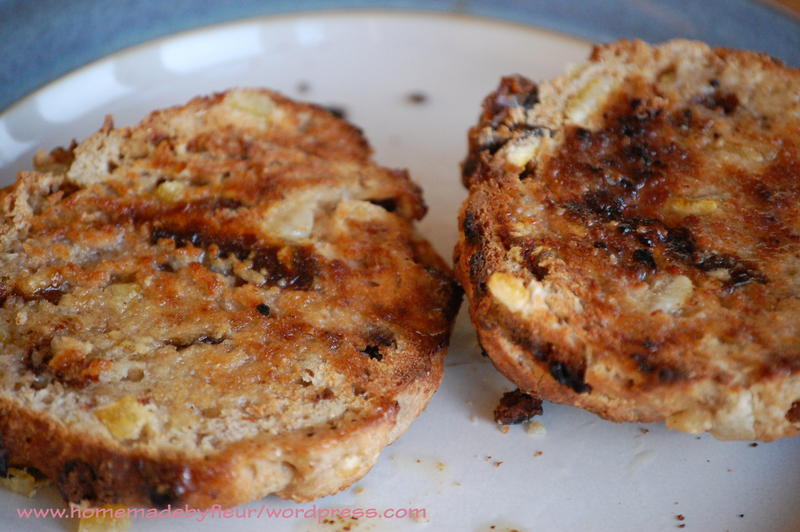 I actually love and hot cross buns and would be thrilled to eat them all year round. The way I like them is toasted, spread with unsalted butter and a cup of tea to wash it all down. I have to say though that I’m not great at making bread items. I truly believe that it is something that takes a lot of practice, so I continue trying in the hope that my next effort will be better than my last. 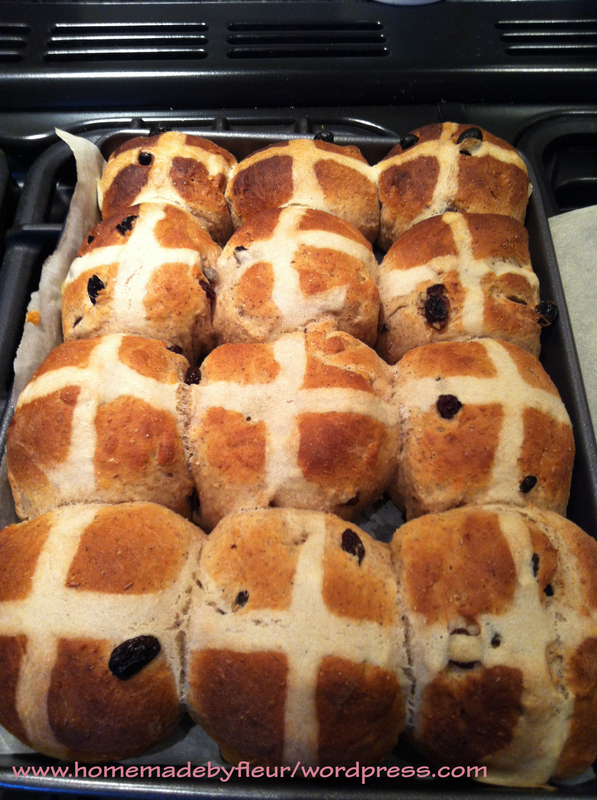 It’s a good job I think like this as my first attempt at hot cross buns were only just passable, but my second attempt was pretty near to perfect in my eyes, (picture below). I would have liked to know what Paul Hollywood thought of them! I digress. The most delightful thing about homemade hot cross buns are how much better they taste in comparison to shop brought which makes them totally worth the effort, even if they do take a few attempts to get right. 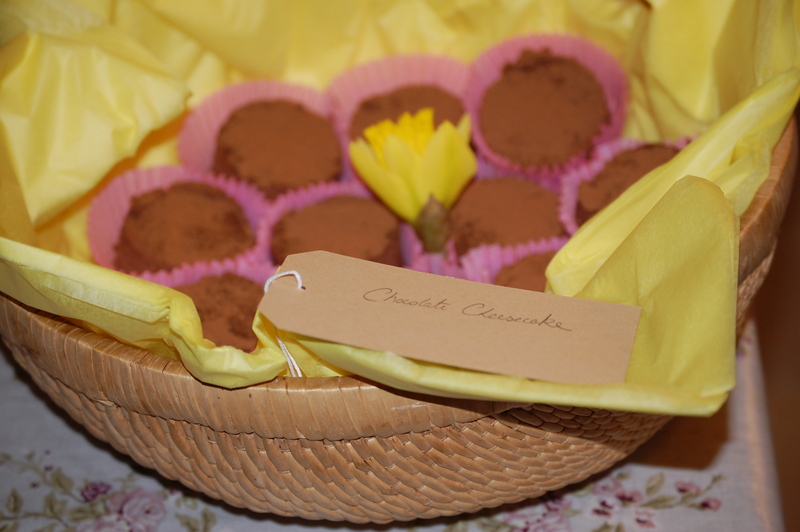 The Baking Mad website also have a number of other Easter recipes that are worth having a look at, they include simnel cake, cake pops, Easter cake and Easter cupcakes. Another wonderful thing about Easter is of course Easter Eggs. I love to look around the shops each year to see what temptations have been created. I’m always drawn to eggs that are a bit unique or have something special about them. 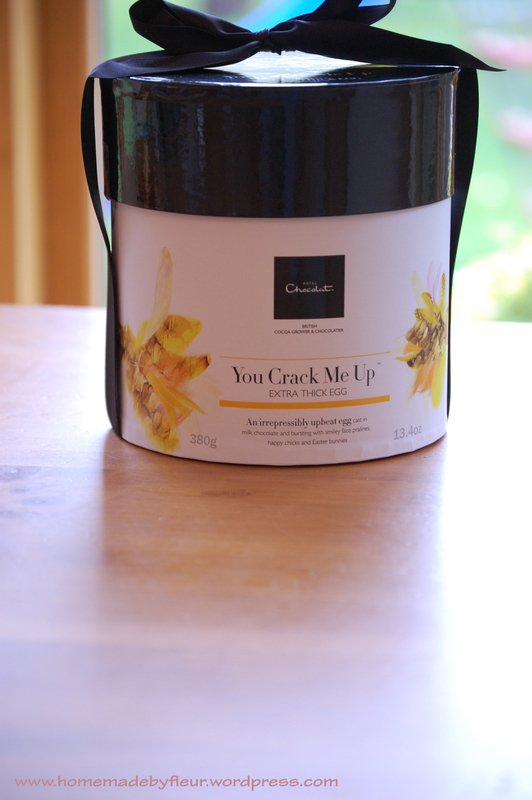 Hotel Chocolat, who are fast becoming a firm favorite of mine have a marvelous Easter egg selection and I was lucky enough to be allowed one to review (or scoff which ever way you like to put it). 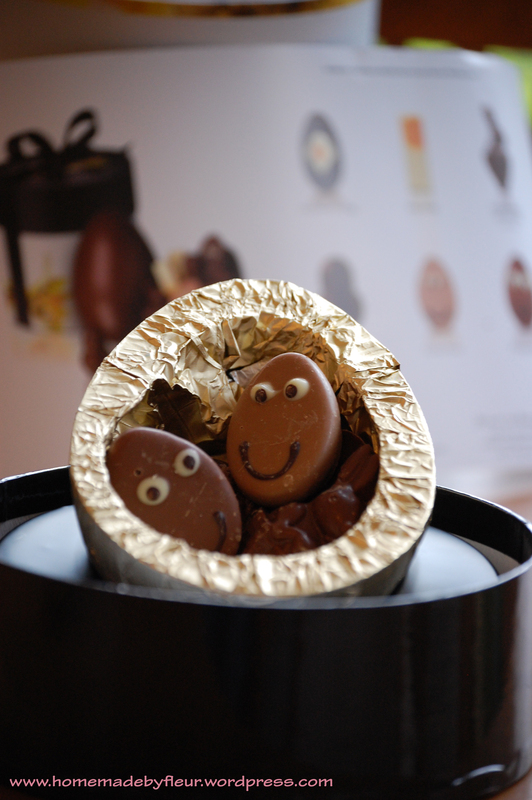 I picked the ‘You Crack Me Up‘ egg with extra thick shell because I loved the look of the chocolates that came inside. 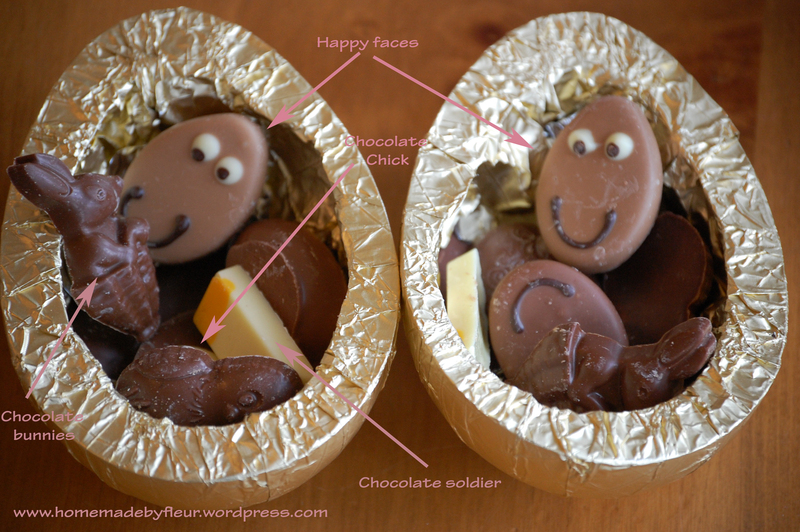 Little happy faces, chicks, fried eggs and soliders all appeal to child in me and I thought it was likely that my own children would be wanting some of this egg too! I was not disappointed. All (and that is saying something) the chocolates were lovely. If anything there could have been more! The shell was indeed extra thick and gave the egg a real feel of quality. I loved the packaging too. It came in a gorgeous box and the egg itself was wrapped in the most lavish looking light gold foil. Many thanks to Hotel Chocolate sending me the Easter Egg to review and Baking Mad for sponsoring this post. 28/03/2012. Tags: baking mad, baking with the children, Easter baking, easter eggs, easter gifts, hot cross buns, Hotel chocolat, Hotel Chocolate gifts. 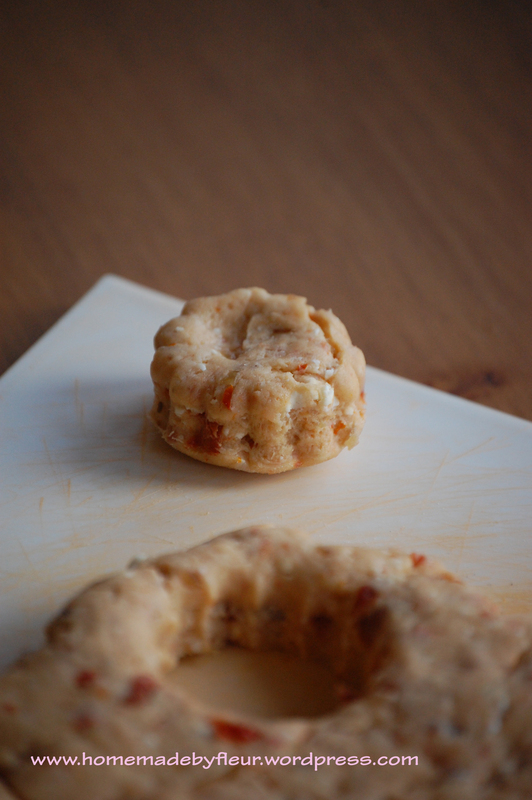 Easter Baking, Reviews, Sweet Baking, Uncategorized. 1 comment. Well, my TV debut has finally aired and now I can scream at the top of my voice “I WON, I WON!! !” I still can’t quite believe it. Yes, I went there with every intention of winning but I had no idea what my competition was going to be like or how things were going to turn out on the day. I made so many cheesecakes in the week leading up the show and I really felt that I went on a cheesecake journey during that time. Going from sheer panic to refining my ideas and feeling confident in what I was doing and looking forward to the day. When I heard we were making cheesecake I was initially quite pleased…until my first cheesecake ended up looking like a cow pat. I kid you not! 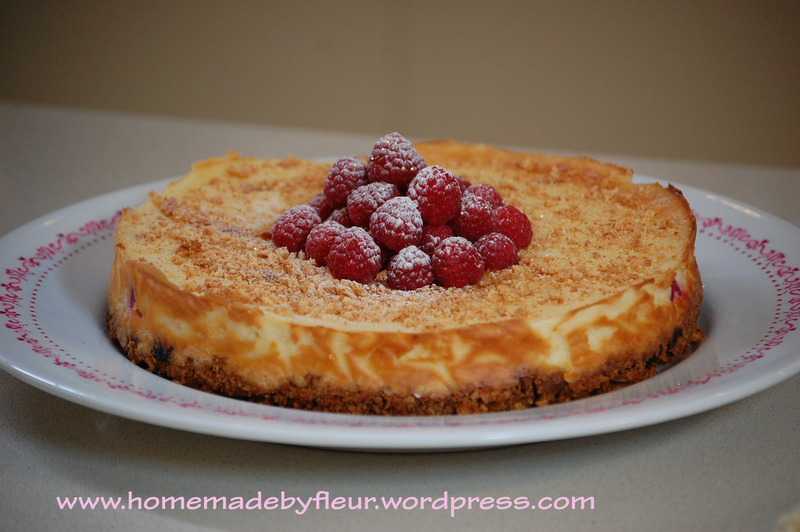 Making a large cheesecake in 2 hours I came to realise was not possible for me. My hat goes off to Christine who did manage it on the day. I tried her raspberry cheesecake and it was superb. The problem is it takes 50 mins to cook a large cheesecake and in an ordinary situation you are meant to leave it to completely cool in the fridge overnight before taking it out of its tin. When practicing at home, removal of the tin after a mere 15 mins of cooling, (due to the time constraints) made my large cheesecake efforts crack and dip in the middle. It looked a bit more presentable covered in chocolate ganache but there was no way I could give it to Eric on national TV. Then the lightbulb moment came. I would make a little cheesecake. 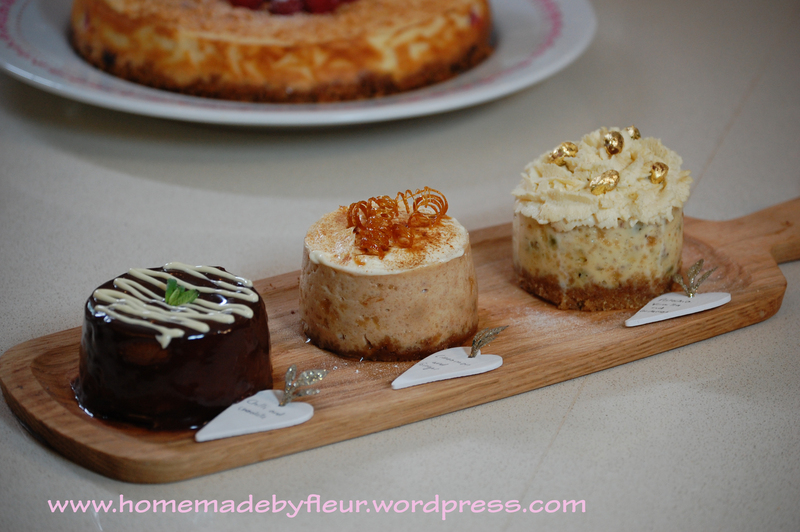 It would cook and cool quicker and because I could not decide on what flavour I was going to do, I came up with my next lightbulb idea of cooking 3 complimentary flavoured cheesecakes, each one with a different base and bespoke decorations. The first time I tried to cook them, they came out perfectly and the relief was massive. At least I there was a chance that I would cook something which had a chance of winning. 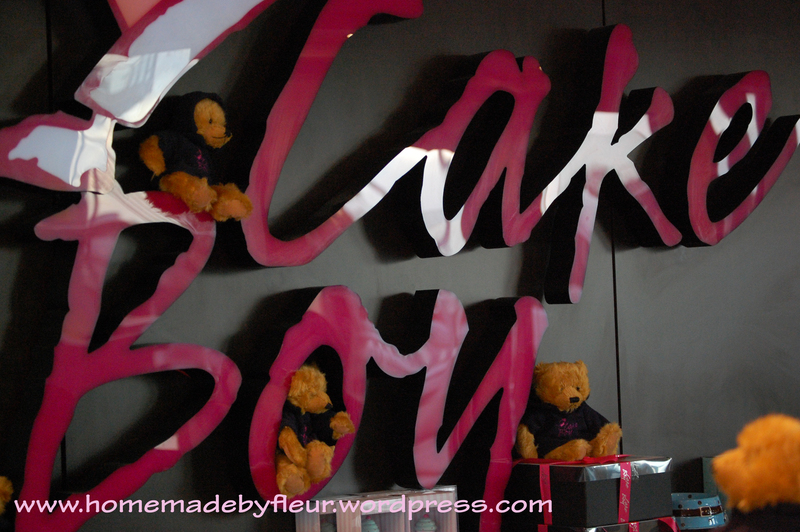 When the day came, I was up at the crack of dawn as we had to be at Cake Boy (Eric’s cake shop and cafe) by 8.30. Once I got there I soon felt relaxed with a coffee and it was lovely to get to know my fellow contestants Christine and Hannah a little bit. Cake Boy is gorgeous. It has the most amazing selection of cakes which Eric bakes himself every morning and the comfy seating next to a wall of fairy lights is inspired and gave a magical feel to the place. All of the production crew were extremely friendly too and talked us through what was going to happen during the day. Considering we were the second to last episode to be filmed and there are 20 episodes in total, I think the team did so well. They must have been exhausted from it all. Just before we were about to start and as I was finishing my coffee, I looked up to see none other than Nigella Lawson sitting opposite me chatting to Eric about cakes (of course). She had popped in with a couple of friends who were getting married and who wanted to order one of Eric’s spectacular wedding cakes. I almost choked on my coffee. What a fab start to the day to see Eric for the first time along with Nigella. Star struck? Quite possibly! 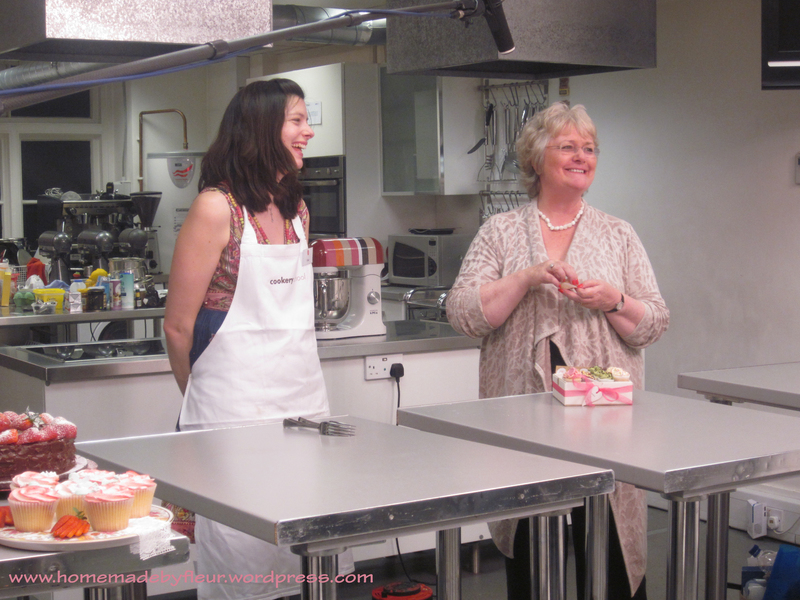 We then got to work filming some sound bites about why we wanted to take part in the show and what we were cooking. 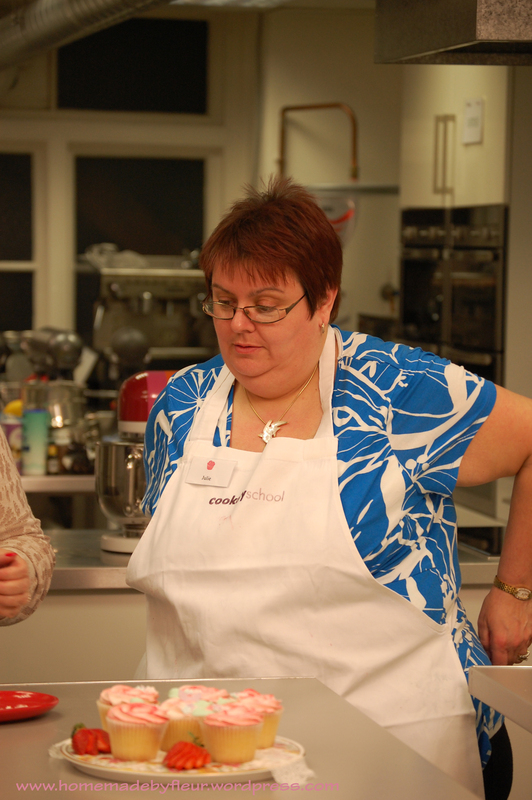 Then we had to get our ingredients ready and the bake off began. I thought I was feeling calm and collected and things were going well. Then I took my cheesecakes out of the oven and with two cameras filming, all the production crew and the two other contestants watching I had to take all three out of their tins. Possibly the hardest part as the tins are small and I had to push the cheesecake up and out. So much could have gone wrong especially as they are still a bit soft when they first come out of the oven. 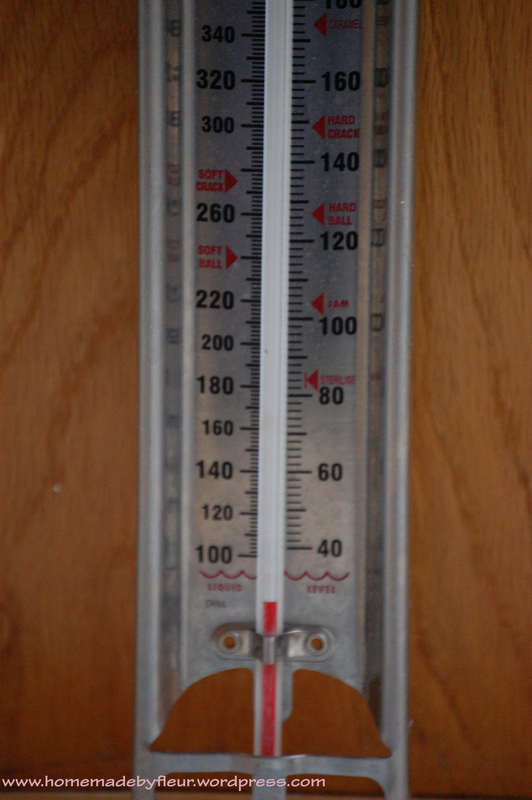 I was shaking like a leaf and could hardly cooridnate my fingers, but I managed all three and took a big sigh of relief. Once out, I could relax a bit and start to decorate them. I over whipped my cream which made it a bit hard to pipe, but other than that I was really pleased with the end results. We had to wait for ages to take our creations into Eric, and when I did, he really gave nothing away. Then we had to wait for even longer whilst they filmed Eric’s reactions to the cakes, but finally the time came for him to announce the winner. I had come to realise by this point that in order to make a TV show, there needs to be lots of re-takes to get it just perfect. This was indeed the case as well when announcing the winner. Eric must have said, “and the winner is….” about 6 times, before he finally said, “…Fleur”. At which point I actually almost cried. It meant so much to me to have Eric pick me. I knew I could bake, but to have a master cake maker pick me was such an amazing feeling. I was so worried that I may have over done my flavours and he would not like them, but he told me afterwards that it was my flavours that made him pick me in the end and he liked the fact that I took a risk with something different. Needless to say the masterclass was brilliant. I got to know Eric a bit better, and there was plenty of banter so it was a real laugh. 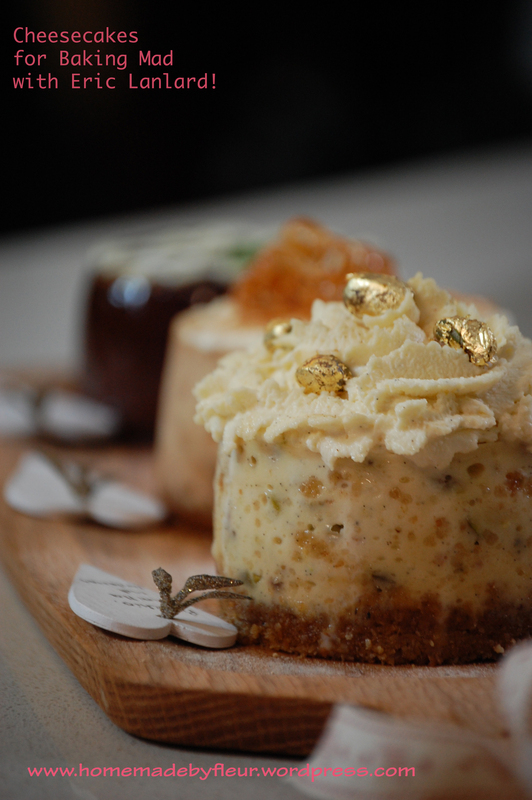 We made a peanut butter and chocolate cheesecake covered in gold leaf and it was absolutely stunning. 26/03/2012. 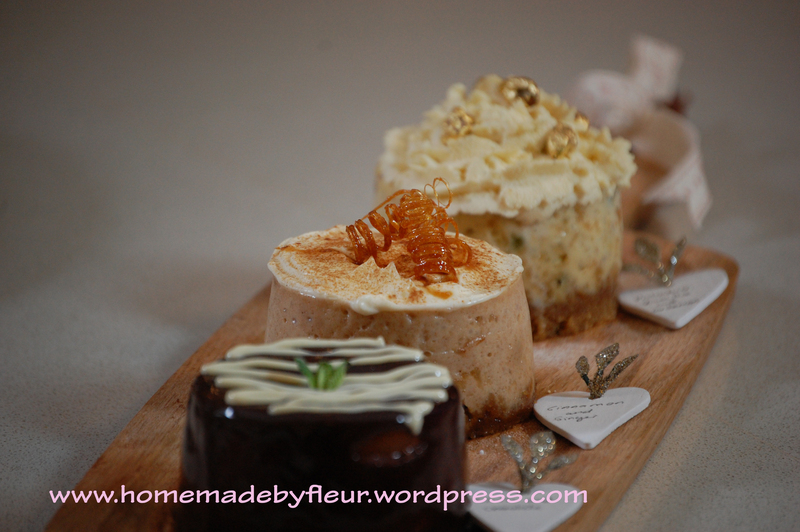 Tags: BakingMad with Eric Lanlard, cake boy, cardamon, chilli and chocolate cheesecake, ginger and cinnamon cheesecake, gold leaf, Mini cheesecakes, Nigella Lawson, sugar corkscrews, vanilla and pistachio cheesecake. 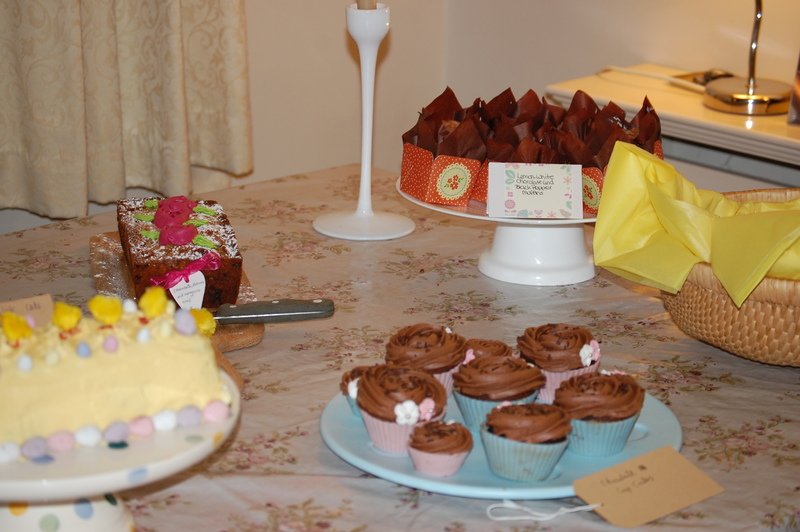 Bake Off, Party, Sweet Baking. 18 comments. I love a bit of retail therapy. It used to be clothes that I ‘needed’ to shop for, and whilst I still love fashion, being a mum of 3 has certainly changed things for me in this area. For a start my shopping time is now almost non existent. Taking children clothes shopping is a definite ‘no no’ for me. I tried it once and managed to lose a child (worst and longest 5 mins of my life) as well as cope with numerous tantrums and continuous whinging. Never again! The other issue is that whilst clothes look lovely in catalogues or on the rail in a shop, there is a high chance that they will be covered in snot/food/mud/paint/glue/playdoh/……. (fill in the blank) by the end of the day. I could go on but I’m guessing that you understand my predicament, and if you are a mummy yourself, you might well be able to empathise. It’s ok though because I have found a whole new world of things that I want to buy that won’t get ruined by children and can normally be researched and brought on the Internet quite easily, (husband rolls eyes and groans at this point). Kitchen inventions, gadgets, bakeware, items for the house and home, however you like to put it, I’m loving it. 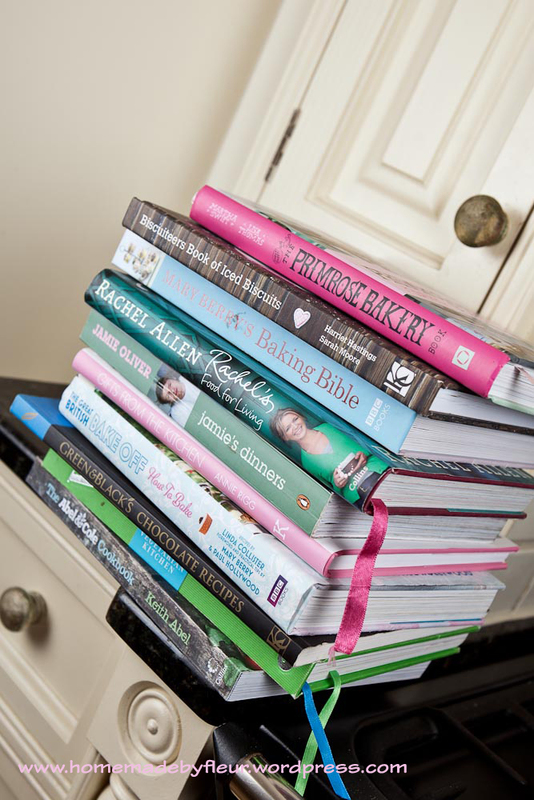 It seems the ‘baking bug’ that is sweeping the nation right now has brought an explosion of new ‘must have’ items. Everywhere I look a new kitchen product is being marketed claiming that every home baker would be lost without it. Whilst I think that negotiating my way through all of this is part of the fun, it can also be a bit daunting, and I have of course made mistakes and wasted money. So I came up with the idea of sharing my top ten baking gadgets and kitchen inventions with you. These are just things I have got which in my opinion are great buys. Things that I could not do without now and which I would recommend investing in if you are like me and a keen home baker. For a long time I was happy just using the small grater on the side of my cheese grater when adding zest to recipes, but then I started to notice a new type of grater in cookbooks and on TV shows. 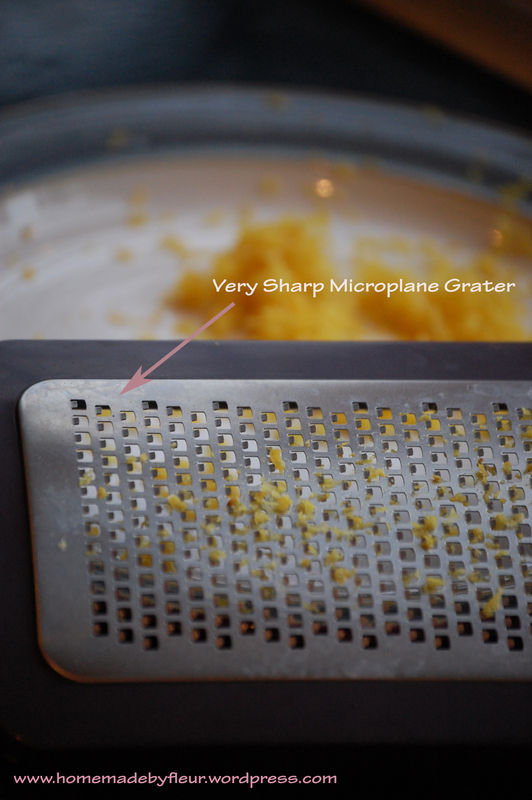 You don’t have to do much research to find claims that this grater makes magnificent flavoursome zest because of it’s design. It has little square shaped blades which are very sharp and I guess this cuts the zest off in such a way that it is deeper and less mushy. Sounds a bit ‘pie in the sky’ but I decided to get a Lakeland version of this grater which was quite a bit cheaper than other makes, just to see what all the fuss is about. Straight away I noticed a difference. The zesting was easier and I have to agree that the taste of zest is much stronger in the bakes that I have made. Be extra careful of your knuckle’s though, as the thought of catching them on this makes me grimace. 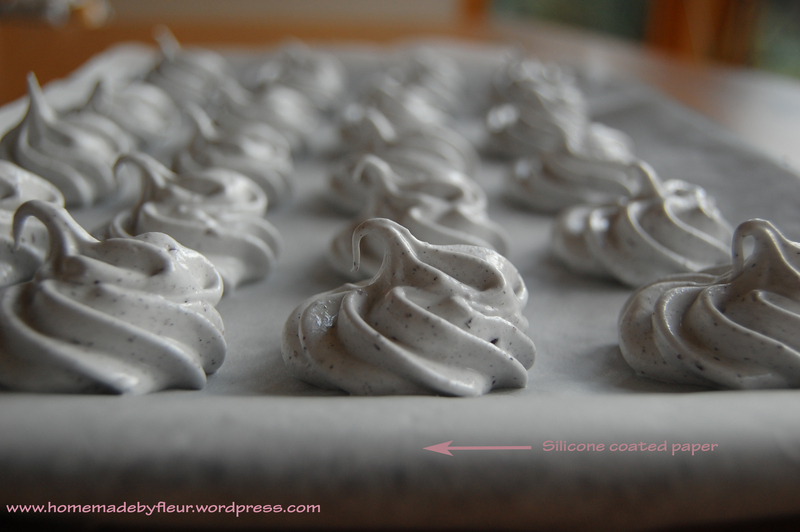 I love my silicone pastry brush and I often wonder why these were not on the market sooner. 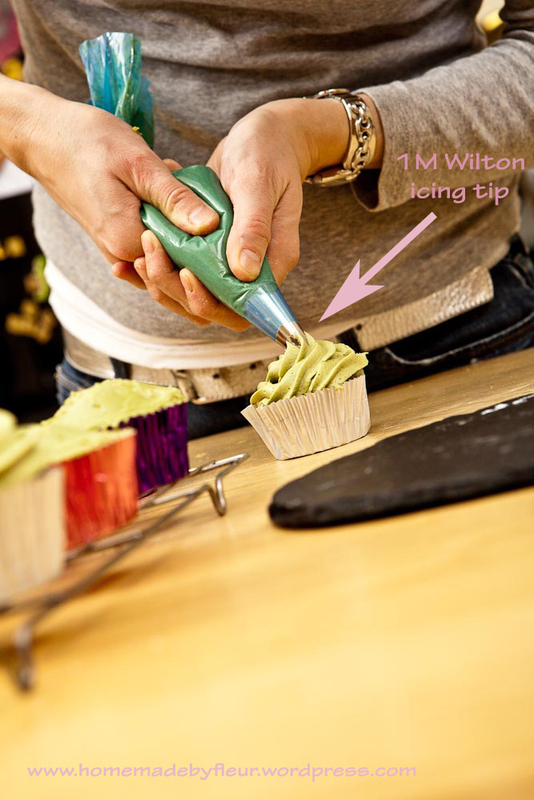 The main advantage is that they are so much more hygienic than the ordinary pastry brush. I could never get my old brush really clean and it always seemed to be sticky with whatever was on it before. 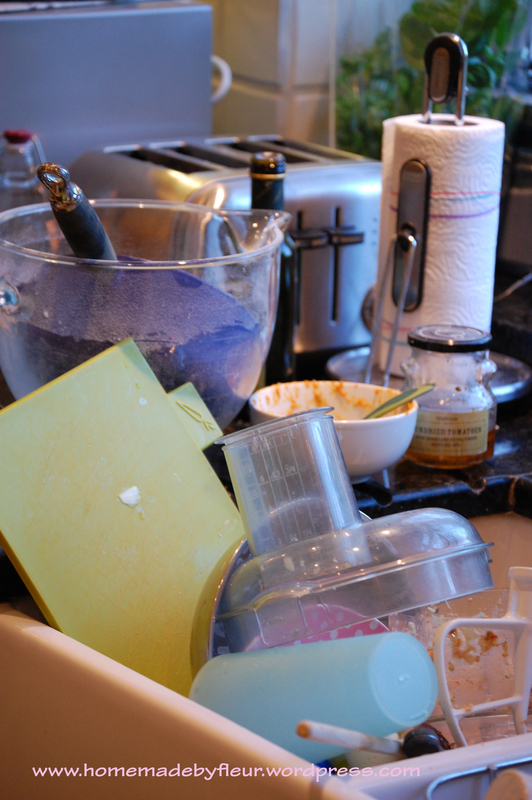 A silicone brush can be put through the dishwasher and comes out clean and dry. As you can see from my ‘hot pink’ one they come in a range of fun colours making them appealing for children to use when baking with you. I used to have gorgeous looking kitchen scales. It had a vintage design and always caught my eye when sitting on the side in the kitchen. 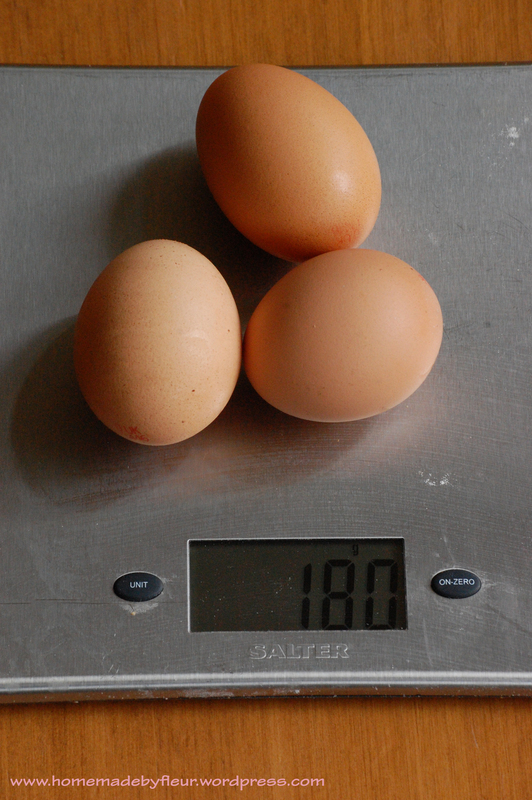 But I could never get really accurate measurements with it and the more baking and reading about baking I did the more I realised that my scales were just not going to cut it. I needed digital scales, because baking is a science and for optimal results precise amounts of ingredients are required. I brought a fairly cheap digital scale and instantly noticed a difference. My baking has significantly improved even if I do say so myself and it has made me more confident and willing to try new things as a result. If you are looking to get one I would recommend one that has lots of different measurement unit options as you will probably end up using them all. Key units for me are grams and millilitres. 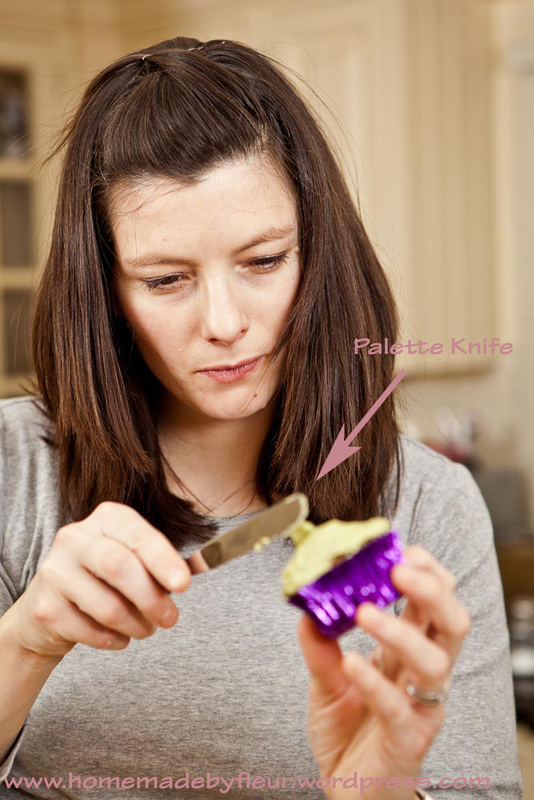 It was not until I got myself one of these tips that I could manage to make my cupcake icing look any good, and I’m really not exaggerating. This tip has been a revelation to me. It effortlessly creates the most beautiful icing swirls on top of cupcakes and I feel like my cupcakes are much more professional looking now. You just start from the outside and work into the middle and it is as simple as that! You can also start in the middle and work out to create a gorgeous rose effect. At around £2.50 they won’t break the bank either. This is a fairly recent purchase, but has been incredibly useful. I have used it so much more than I thought I would. I’ve been able to heat sugar to create decorations, make italian meringues, macaroons, honeycomb and temper chocolate for my new silicone moulds. I’m sure I will use it to make some kind of jam this summer too. Before I had one I think I used it as a bit of an excuse not to do certain recipes and never really experimented very much with heating sugar. But I was missing out because it is a lot of fun with some pretty amazing results. You just need to look for ‘sugar corkscrew’ on You Tube to see a whole range of videos telling you how easy it is to make a most delightful little decorations for your desserts. I have tried it and vouch for it being easy and extremely impressive. 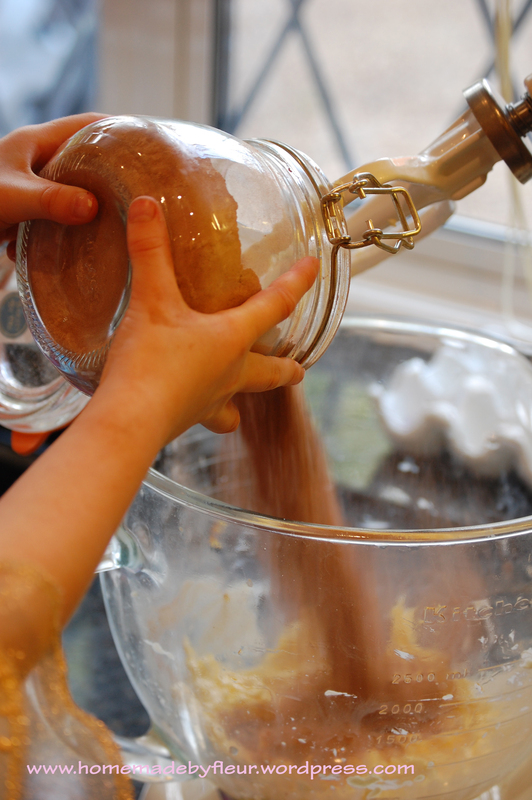 One thing I would say is to make sure that all children and pets are completely out of the way when you make anything that requires heating sugar to a high temperature. Common sense I know but I feel better for saying it. I know that this is not within everyone’s price range, but there was no question that this had to go on my top 10 list of kitchen inventions. I got mine over 4 years ago and have used it most days ever since. 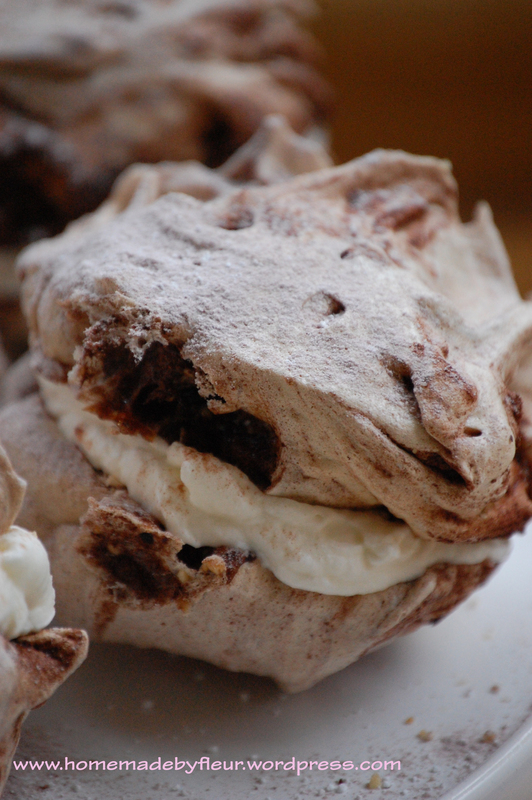 It mixes cake with ease, kneads dough beautifully, and I have never made a bad meringue with it. I love the look of it on my kitchen work top, and would say that for me it has been money well spent. I love my glass bowl too. 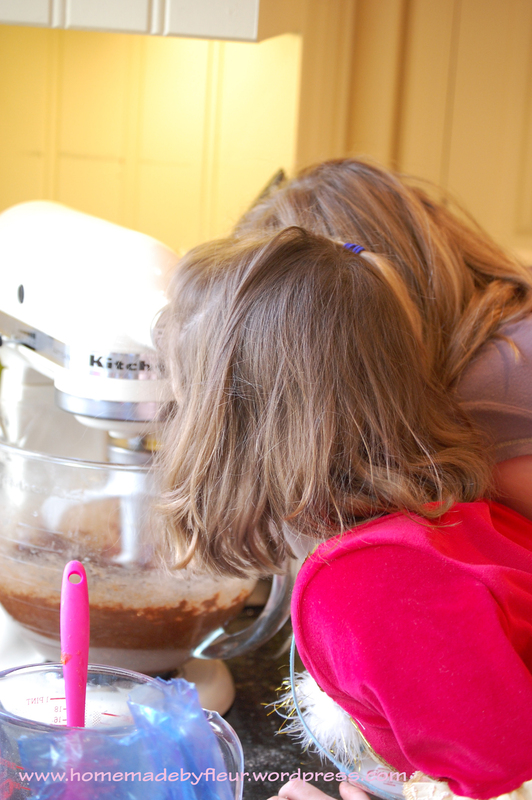 It is so helpful to see what the mixer is doing whilst getting the next bit ready. 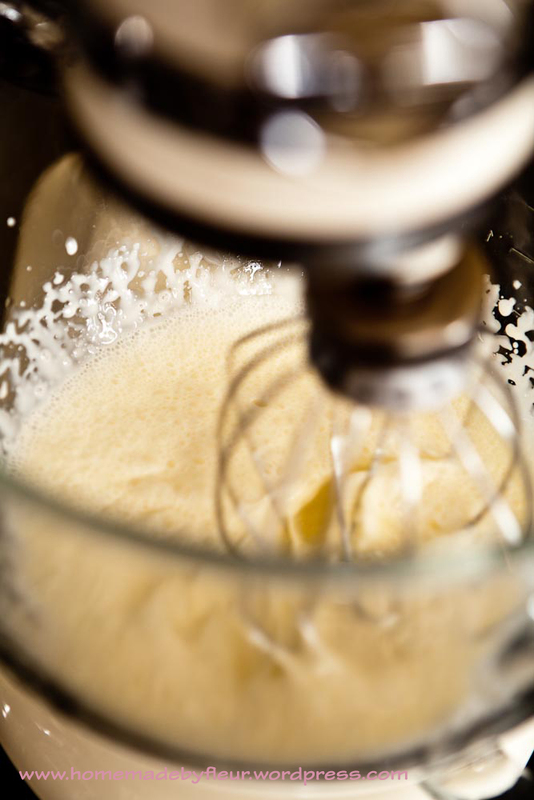 If you love baking you won’t regret buying a mixer like this. The rival to a Kitchen Aid is a Kenwood mixer, and I have used one of these too. There is always lots of discussion in baking circles about which one is best but I think they are pretty equal in performance and features. It probably boils down to which one you like the look of most in the end. Before I discovered this I would regularly find myself in sticky situations. My weekly homemade pizza stuck to everything, (including non-stick foil) making it a nightmare to serve and on one occasion my husband nearly set the house on fire warming up a slice of pizza in the microwave that had a bit of foil still attached to the bottom! 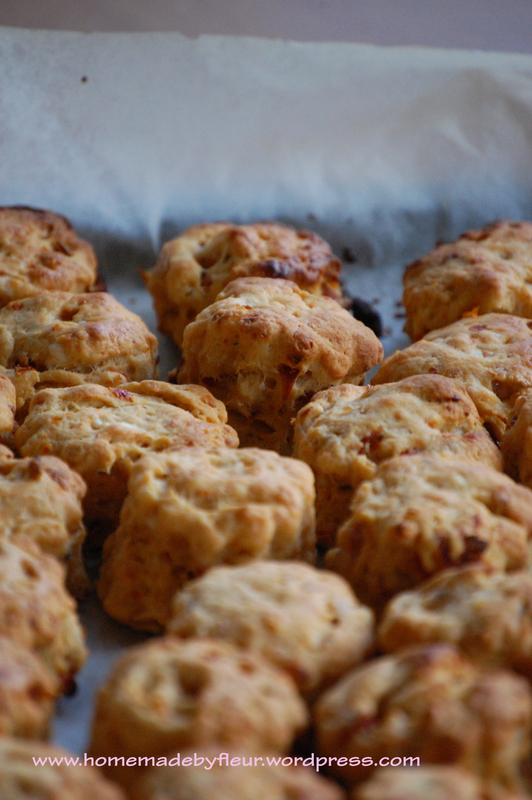 Biscuits would adhere to the baking tray making them a disaster, and macaroons…don’t talk to me about macaroons! Then I saw silicone coated paper that claimed to be non stick and it really does work. For me it is a kitchen lifesaver and helps to make sure that all my hard baking work does not go to waste. Don’t get this confused with greaseproof paper as it is not quite the same. Lakeland call it non-stick paper but I have seen it as silicone coated paper as well. 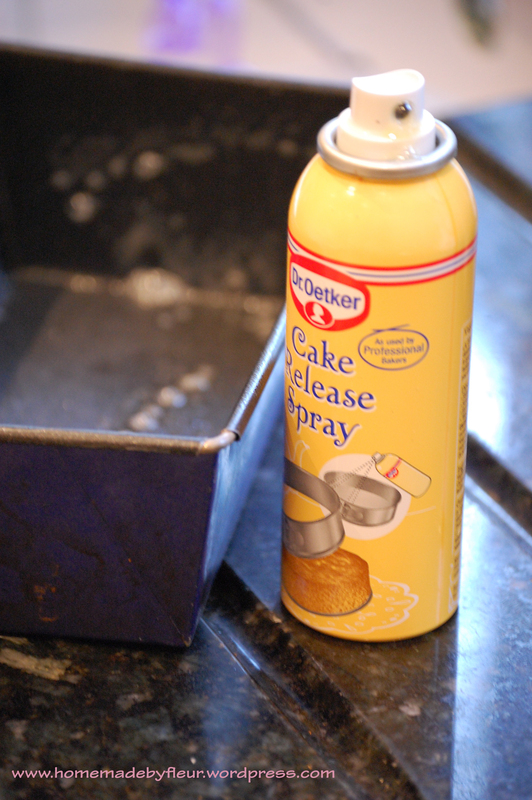 Not too dissimilar from what I have written about above except this is a very handy spray which I use when making cakes, brownies or anything like that. It is so easy to use and I have not had one sticky situation whilst using it. You can line the tins as well as use this but there is no need really as this stuff is so good. It does cost a bit more than a knob of butter that you might ordinarily use to grease your tin but for the time it saves me and the consistent results I’m now a bit of a convert. This is another item that I had no idea how much I would use it until I got one. 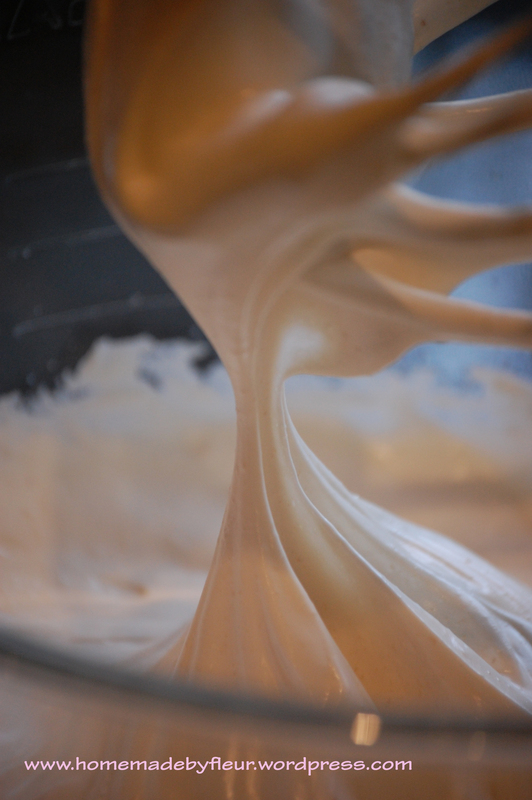 Perfect for smoothing buttercream onto cupcakes, levelling cake mixture in the tin, applying frosting to traybakes, covering cakes with icing, leaving a gorgeous squiggle on chocolate ganache etc etc. I have no doubt that you will get your moneys worth if you invest in one. I only have a little one at the moment but will be investing in a larger one pretty soon. Perfect for me, as love mini cakes, tarts, cupcakes. They are just sooo cute! I much prefer to eat one or two little tarts rather than eat a big one, and I would say that for those of us who bake a lot it is probably quite important not to make full size the whole time as I know I would probably be the size of a house before too long if I did. If you have children, little cakes are perfect treats for any occasion, and you can impress your friends and family with a selection of mini cakes and bakes for a special afternoon tea. 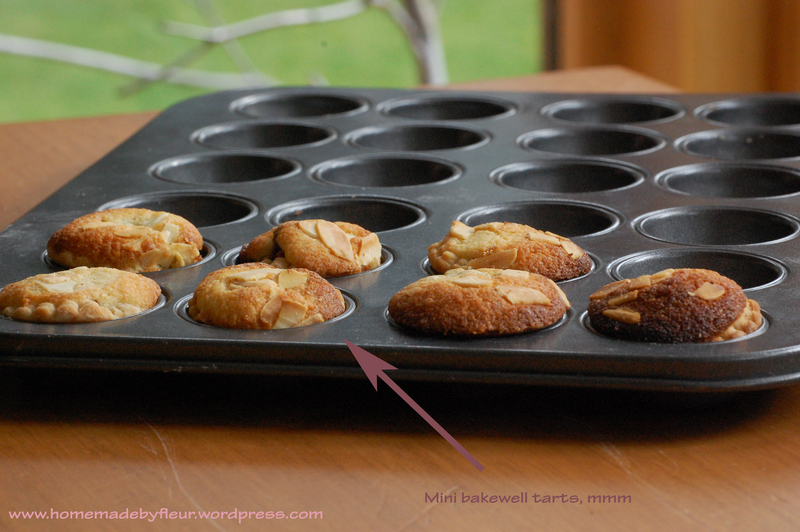 Top tip: if you are making mini tarts, save a small ball of pastry to push your little cut out pastry bases into the holes in the tin without making marks on the pastry or risking putting your finger through it. There you go! I hope you have found this useful. Let me know what you think and what your favorite items in the kitchen are. 23/03/2012. Tags: digital scales, Dr Oetker Cake Release Spray, foodies 100, kitchen aid, kitchen thermometer, M1 Wilton Icing tip, microplane grater, Mini Morals Cake Tin, non stick paper, Palette Knife, silicone coated paper, silicone pastry brush, top 10 baking inventions. Fleur's top 10. 25 comments. 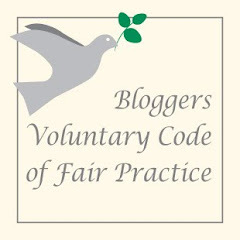 I’ve had such a busy couple of weeks and as a result I have lots of juicy blog posts to write. So much in fact that I was not sure where to start. However, the arrival of some photos and the coolest little video of my day taking part in Katie Fforde’s Recipe for Love bake off competition helped me to make my mind up. I only actually heard about the competition a couple of days before it was due to close, but as soon as I did I knew that I just had to enter my mini cupcakes. They seemed to fit the brief perfectly and I was thrilled to get an email telling me I was one of the five finalists. Taking part also gave me the added bonus of a day out in London on my own, which may not seem like much to some but for a mum of 3 this was actually amazing. I had practiced my mini cupcakes until we could eat no more, and as you can see from this video and the pictures, a great time was had by all, and I was very pleased with the way my cupcakes turned out. I did not win, but I can honestly say that I was thrilled for Fatema (picture below). Her reaction when Katie said her name was lovely to watch and I was just so thankful to have been given the opportunity to take part. 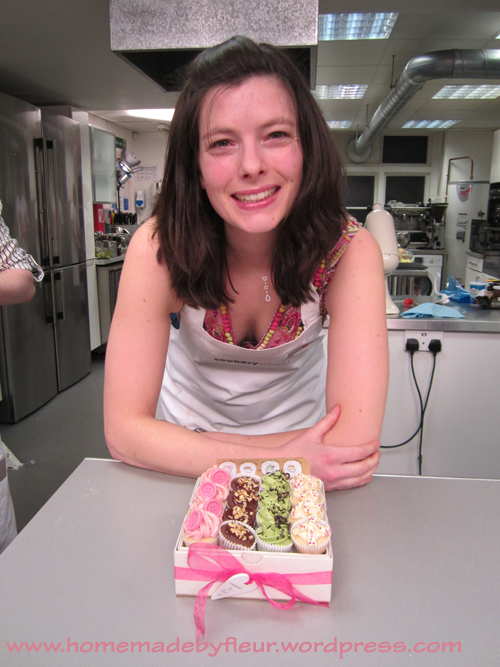 Katie was a complete professional and so complimentary of all our cakes. I could tell that she really enjoyed the day. I’m guessing that might have something to do with the tasting and judging part at the end as well as spending the day with 5 very excited bakers. 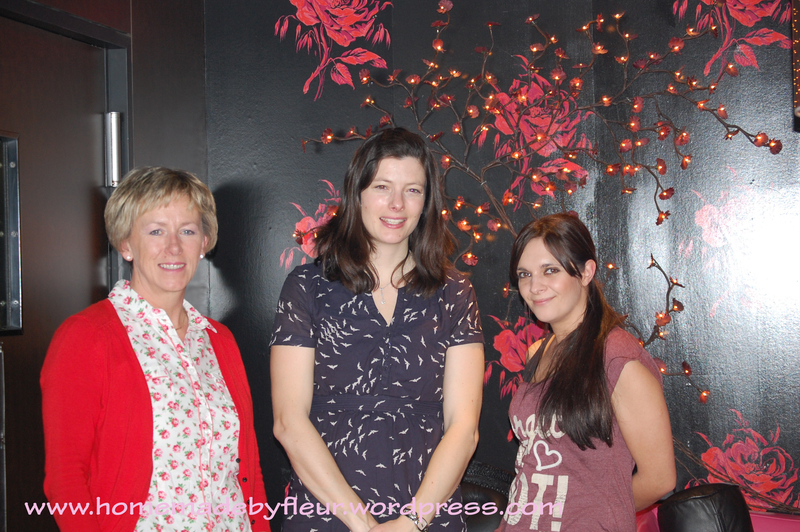 The team from Random House Publishing who had organised the event, did an amazing job too. I’m sure that something like that takes a lot of hard work. I went home with a fantastic bag of goodies including a copy of Katie’s new book Recipe of Love (all about a bake off competition) and the lovely bonus of more baking pals which is such a delight. I’m sure that we will be supporting each other’s baking efforts for a long time to come. 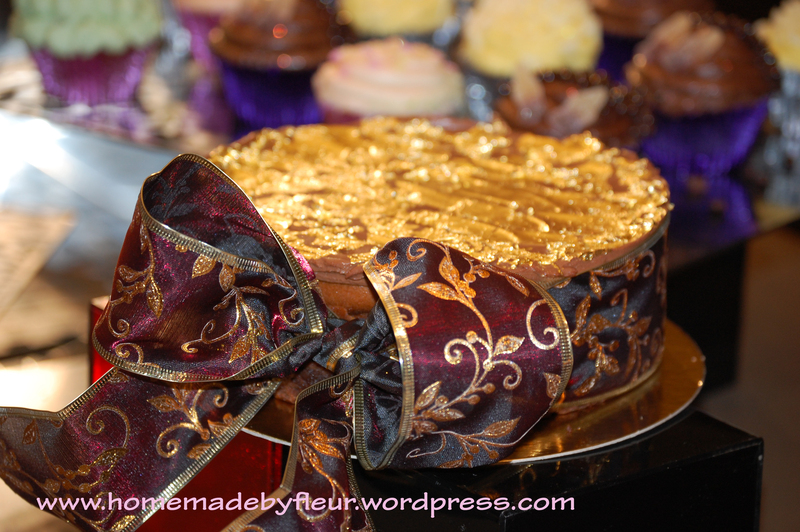 The only problem now is that having competed in two bake offs, (details of my first bake off below) I want to do more! I will be keeping my eye out for the next opportunity and if you see one, be sure to let me know. In the mean time, I think I will be getting my fix from Katie’s book. *Exciting News* You can look forward to more of my bake off action on Channel 4 this Monday (26th March) at 12.05pm when you can catch me taking part in Baking Mad with Eric Lanlard. I’ll be putting up a blog post about that early next week too with photos and gossip from the day. 20/03/2012. 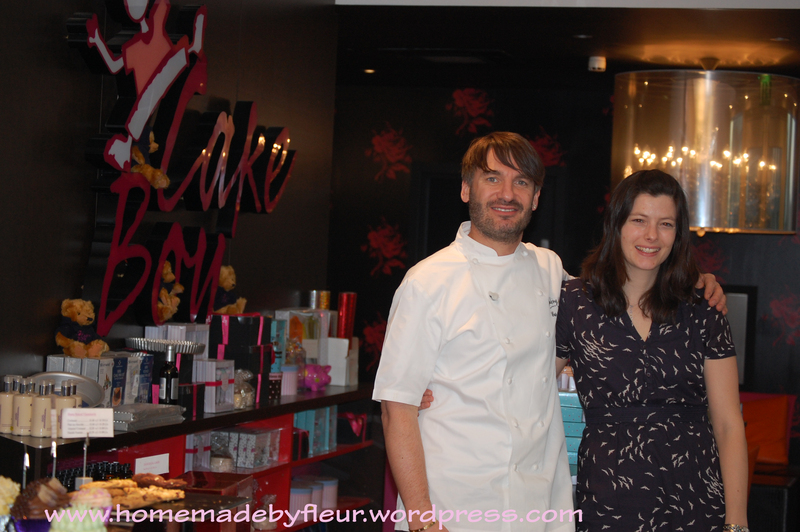 Tags: bake off, Baking Mad with Eric Lanlard, Katie Fforde, Random House Publishing, Recipe for love, video. Bake Off. 16 comments. Today the weather was pretty grim. 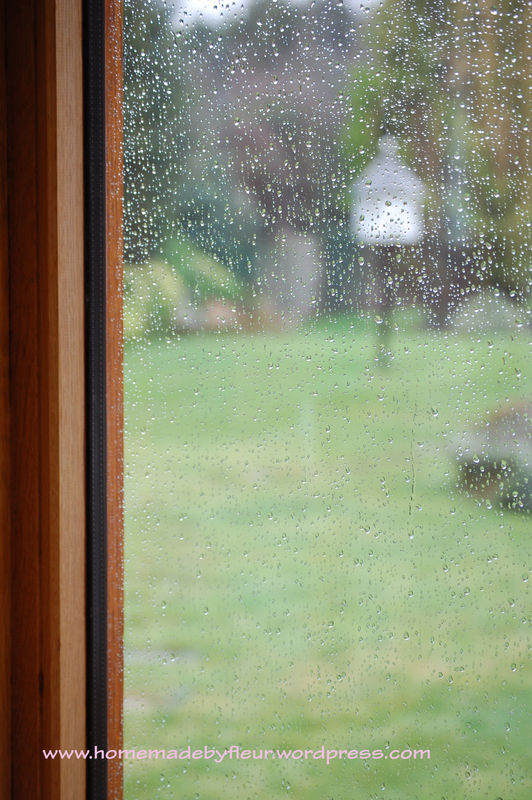 It basically rained all day long. It was not much fun doing the school run and I almost made the decision to skip after school ballet as I just wanted to stay dry. But I managed to sum up the motivation and you’ll be glad to hear that we did all make it to ballet in the end. Some days, (like today) I actually lose count of the amount of times I lift my youngest in and out of the car. Luckily, he seems to enjoy tagging along with his big sisters and is pretty laid back. No doubt this is probably a result if being a third child and having to fit into the daily circus that is life in our household. My Giddy Aunt (she’s not really giddy, that’s just what we used to call her as kids) came to visit last week. It was lovely to see her, but I do hope she will visit again. I fear that we may have scared her off!! It must have been very loud and hectic here in comparison to normal life at home for her in the picturesque village of Melmerby in Cumbria. I do get my evenings though and they are my sanctuary. Peace and quiet with no one demanding my attention is bliss. I normally have lots of accumulated jobs to do but I will make sure there is also time for a few guilty pleasures. Maybe a hot bath with lots of bubbles, (door locked obviously in case anyone is not quite asleep), a glass of red with crackers and Roquefort, baking and then eating said baking, catching up on sky+ (tv is so rare for me these days) and reading blogs, baking magazines and cookbooks in bed! So rock and roll I know, but that is what I love. 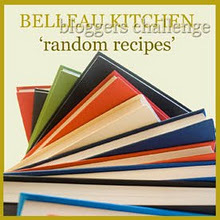 Talking of cookbooks, the new random recipe challenge from Dom over at Bellau Kitchen is to pick book number 17! Well I’ve got to say, that’s about as random as it gets Dom, (and Choclette) but 17 might have to be my new lucky number because my latest cookbook purchase turned out to be my number 17! It might have rained all day today but this was really lucky because I love my new cookbook so much and am thrilled to be able to share a snippet with you. 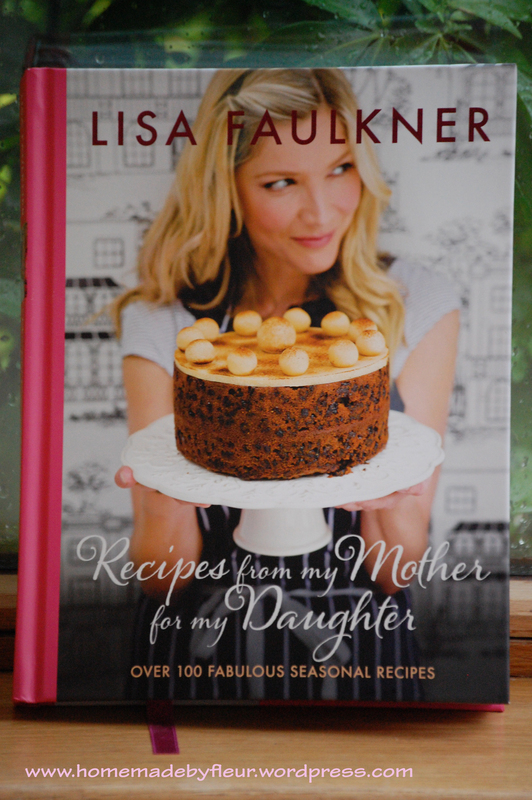 It is Recipes From My Mother For My Daughter by Lisa Faulkner. 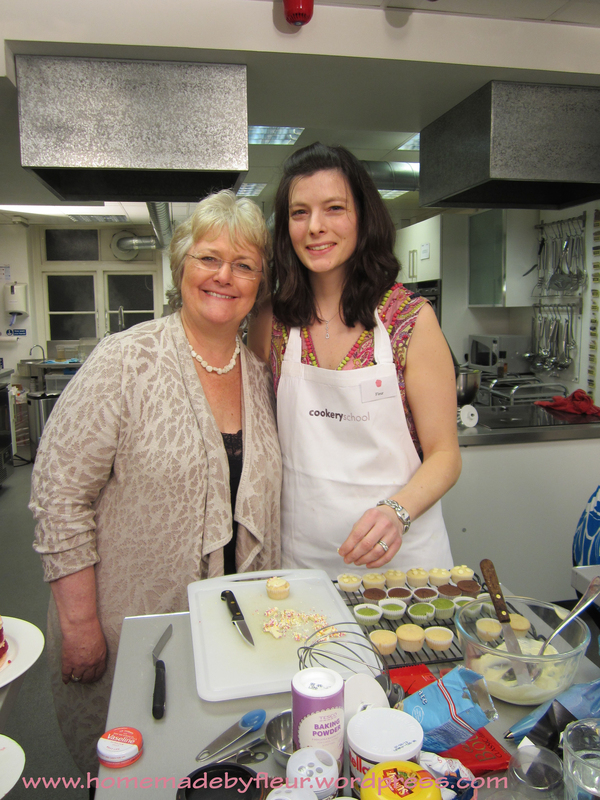 Lisa who won celebrity Masterchef in 2010 is someone I admire greatly. I’d be lying if I did not admit to being a wee bit jealous of her too. When her cookbook arrived I sat for ages looking through it and just dreamed of a day when I could create a cookbook like that too. It’s beautiful! But you will see if you get the chance that Lisa has worked so hard for her success. At the start of the book there is a wonderful narrative where she opens up about what she calls her ‘food journey’. 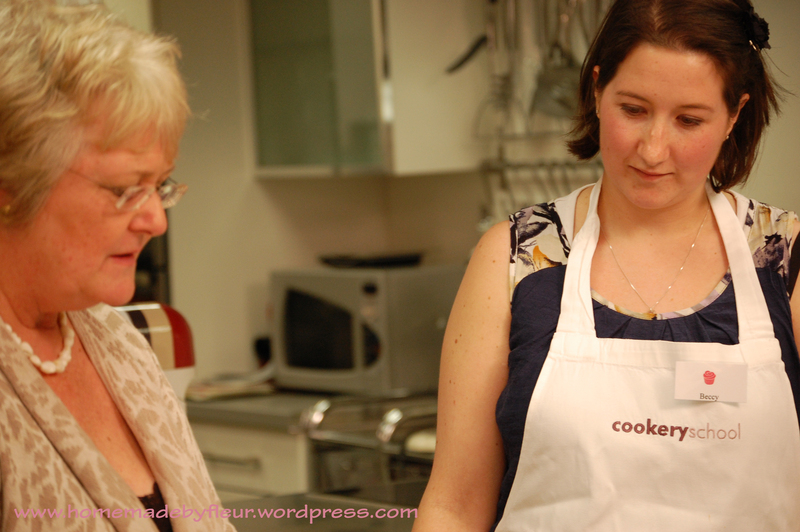 She talks of the inspiration her mother gave her and about times in her life when baking helped her through. I felt privileged to read it, and for me it makes the book even more special. It is a marvelous collection of seasonal recipes, each one with a special meaning to Lisa. 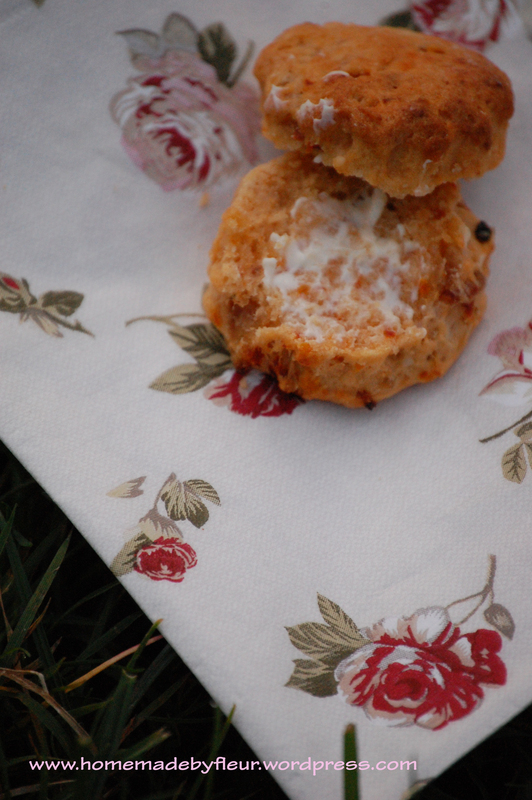 Some are her take on everyday classics like macaroni cheese, and others are suitable to serve at your next dinner party. In fact, I’m going to make Lisa’s lemon sole fillets with shrimp butter on Saturday for friends who are coming over. 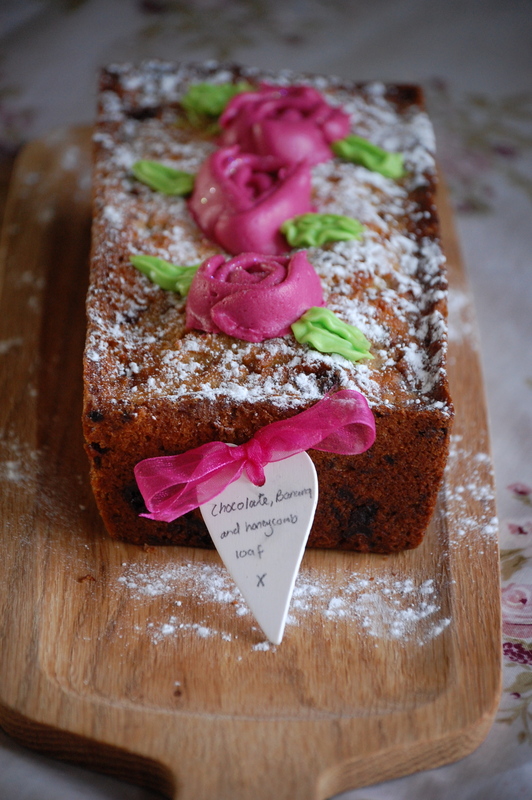 There is also a few gorgeous looking cakes to try which will satisfy those baking mad types…me! 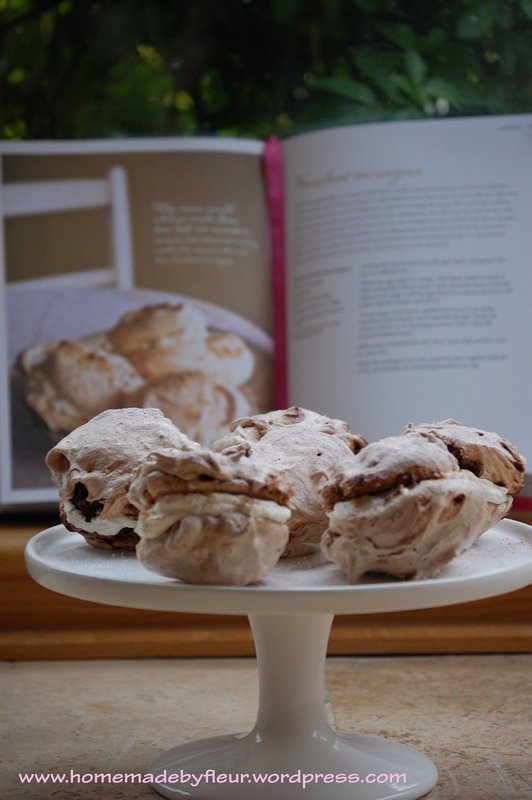 For this blog post I have been inspired by Lisa’s hazelnut meringues which can be found on page 187 of the book. I know this will mean a few sweet blog posts in a row, but I just thought why not and I have a nice savory one planned for next week. 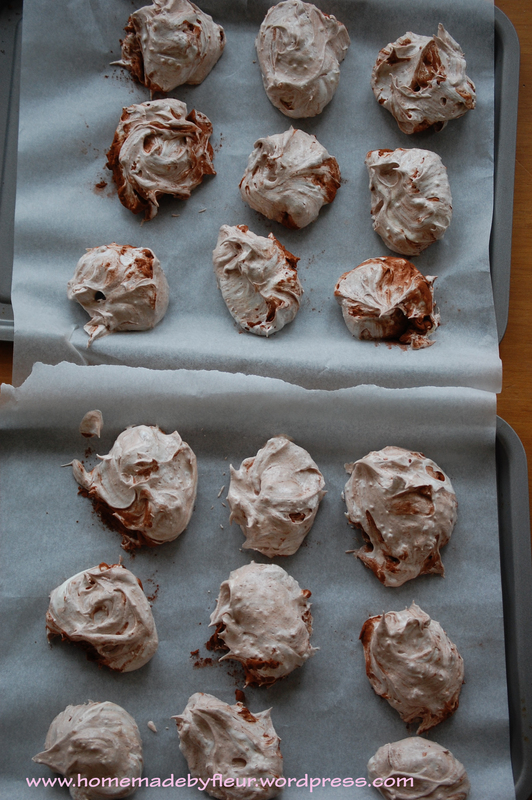 I willingly took Lisa’s advice where she writes; “I want you to experiment with these recipes, try them, substitute ingredients, posh them up, dress them down.” and have come up with Marbled Chocolate and Hazelnut Meringues. So thank you Lisa, here it is, and I can safely say that I really enjoyed it! 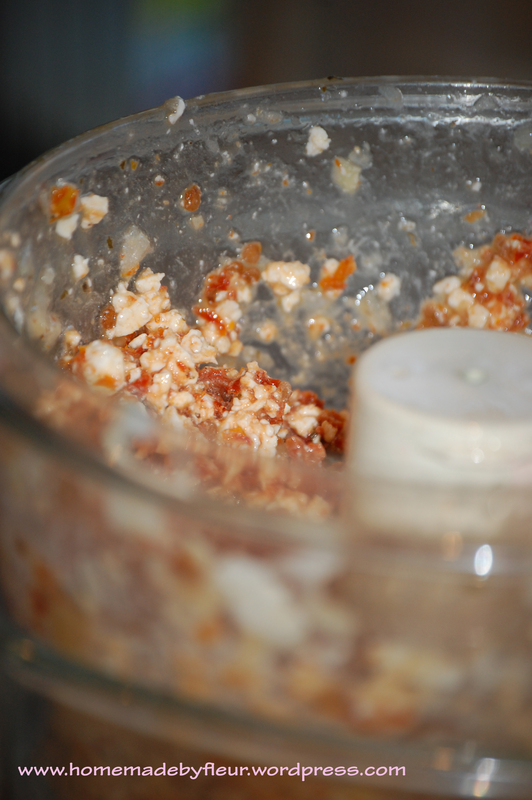 Changes I have made from Lisa’s recipe include lowering the amount of sugar and chopped hazelnut as I felt that not as much of either was needed, but then I always try recipes with less sugar. 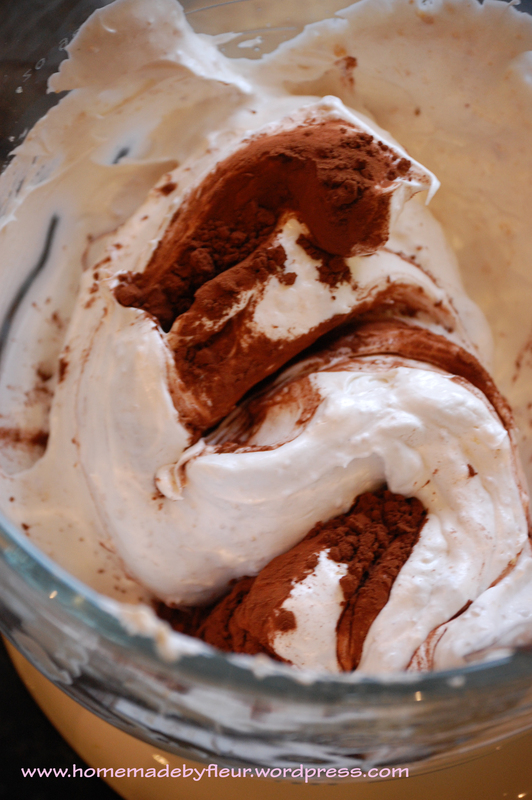 I have also added cocoa powder to create the chocolate marble flavour and effect. Put 50g (save the other 25g for when the meringues are assembled after cooking) of your hazelnuts in a food processor and whiz until they are chopped up as small as possible. 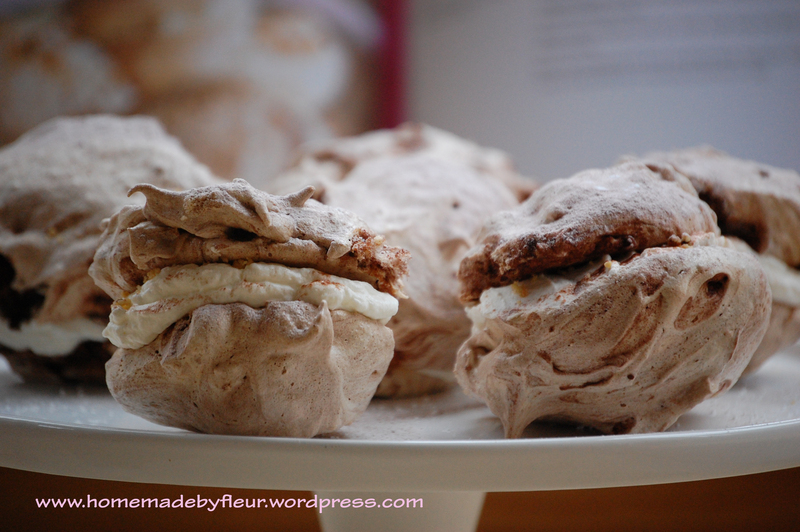 The other great news is because meringue stars with ‘M’ I can also enter into this months Alphabakes blog challenge run by Caroline from Caroline Makes and is shared Ros from The More Than Occasional Baker. Love this challenge so thrilled to enter again. 07/03/2012. 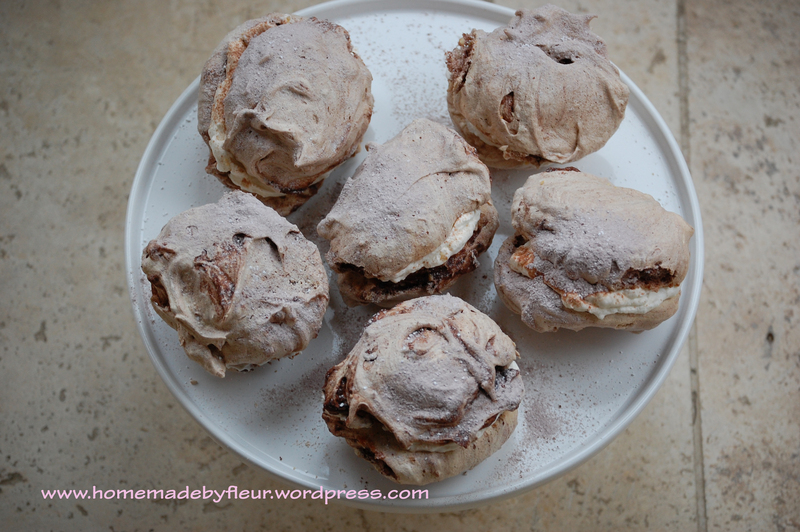 Tags: alphabakes, Chocolate marbled meringue, hazelnut meringue, Lisa Faulkner, marbled chocolate and hazelnut meringues, masterchef, rain, random recipes, Recipes From My Mother For My Daughter. Homemade gifts, Sweet Baking. 11 comments. I digress, back to Saturday afternoons! I don’t normally take the kids out because I think after a hectic week, it’s good to have a bit of time at home, plus with three of them to organise, a whole stack of energy is required to get out the door. 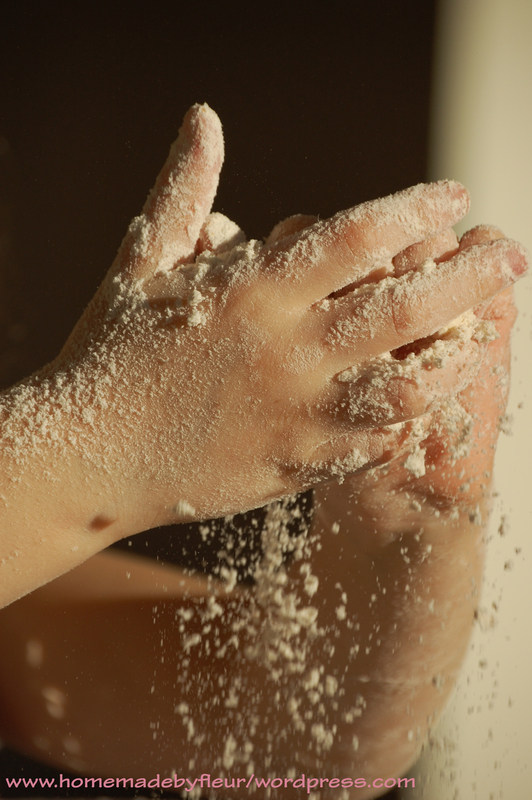 So I look for something we can do at home and quite often we will get our aprons on and prepare to create a baking masterpiece…well that’s what my girls like to think anyway. This week we had the baking activity already planned because thanks to my new twitter pal Iris from Baked By Me (@bakedbymeuk) I had a Easter cookie jar on the side waiting to be used. Baked by Me is a new business set up just a month ago. 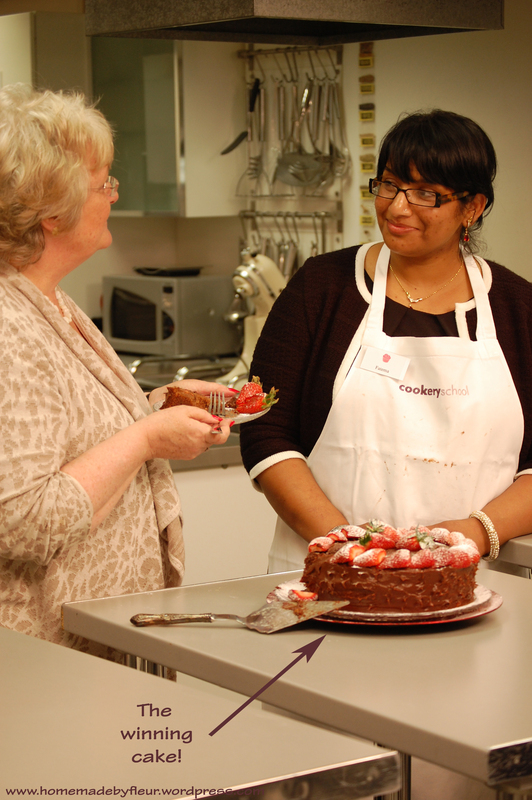 Iris tells me that she loves baking and wanted to share the joy with everyone and so Baked by Me was born. I greatly admire people who have the energy and courage to turn their dreams into reality, and I am thrilled that we got to try out some cookie mix. The jar arrived in a cute little box and when I opened it up I was impressed with the look and feel. There were some nice touches too, a little hand written note, a fluffy Easter chick and gorgeous ribbon around the jar. 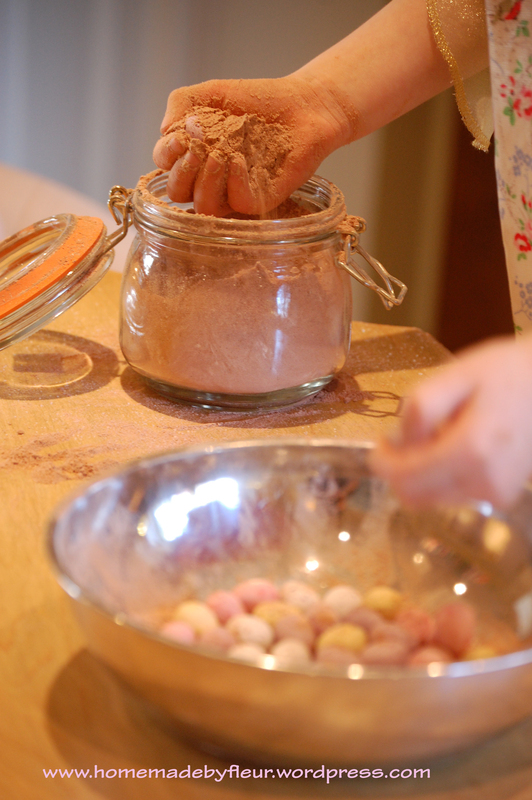 The first job for my four year old was to dig out all the mini eggs, and I could tell that she really enjoyed doing this. It was like a little treasure hunt digging in the sand for gold. I thought there would maybe be 10 or so eggs hiding but they just kept on coming until we had a whole bowl full! 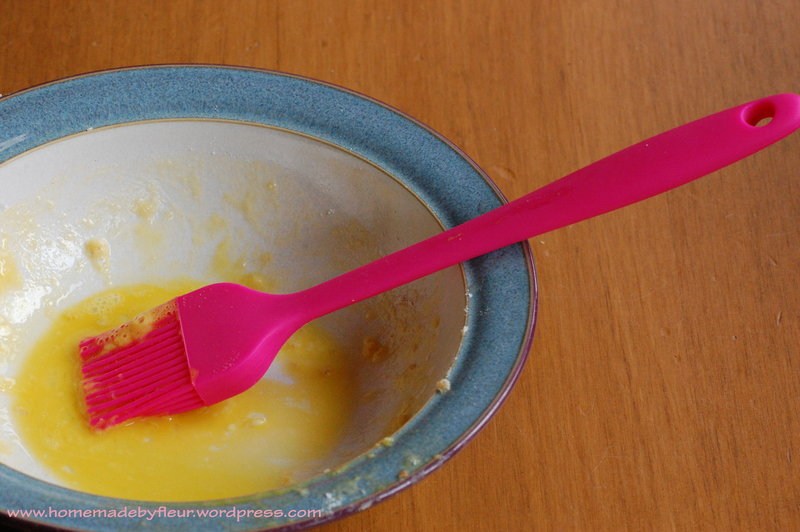 Then we needed to mix up some egg and butter, which was the only two ingredients I provided. 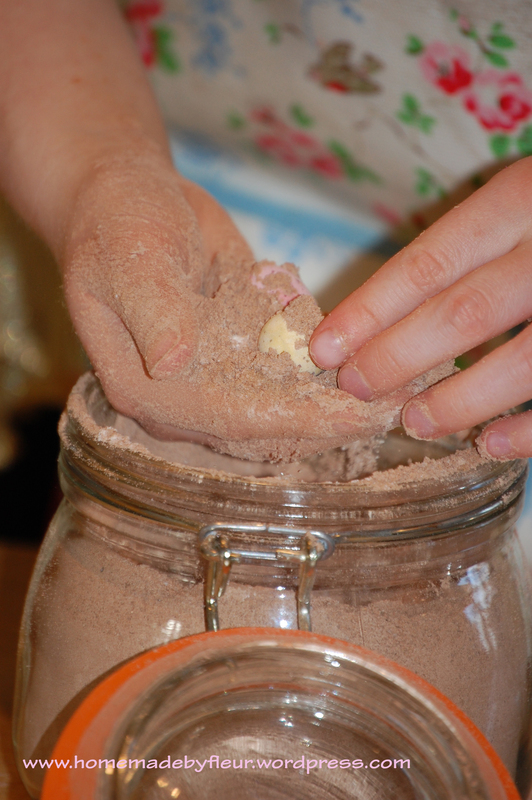 Next, another good job for my four year old, we had to tip the dry ingredients from the jar into the mixing bowl. 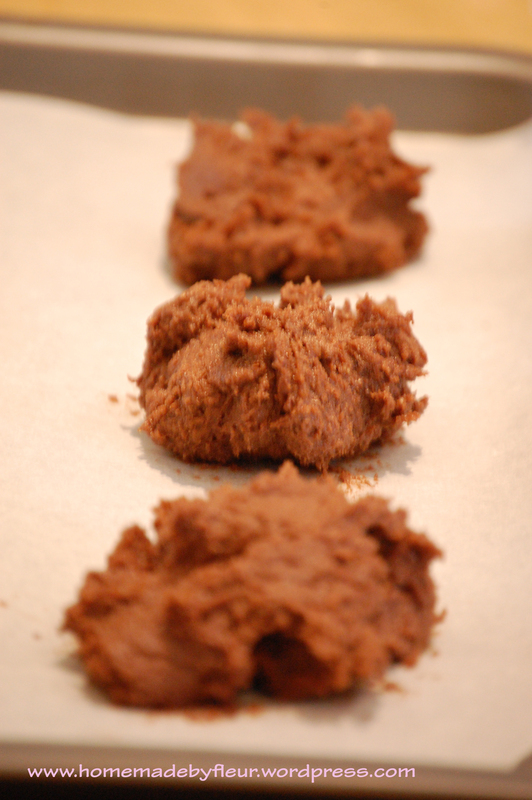 After a couple minutes of mixing, we had the most delightfully smelling chocolate cookie dough. 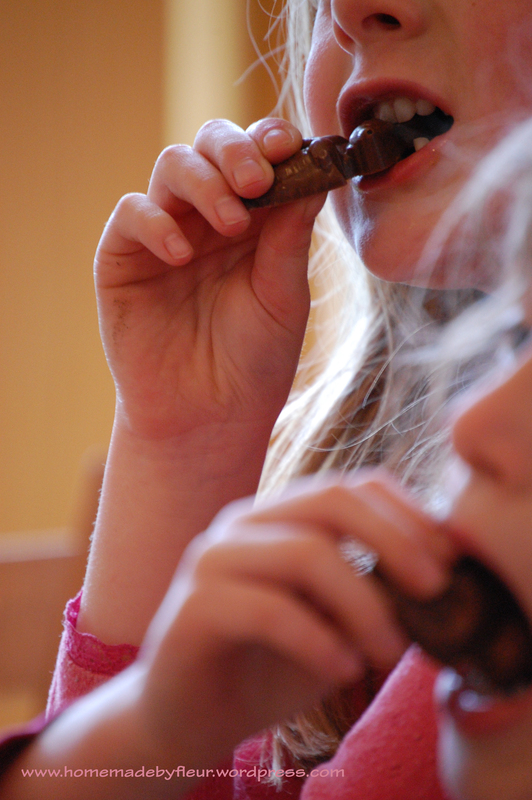 In fact I had to pause the proceedings whilst my girls filled their airways with chocolate. Then it’s just a case of spooning dollops onto a baking tray and baking for 8-10 mins. 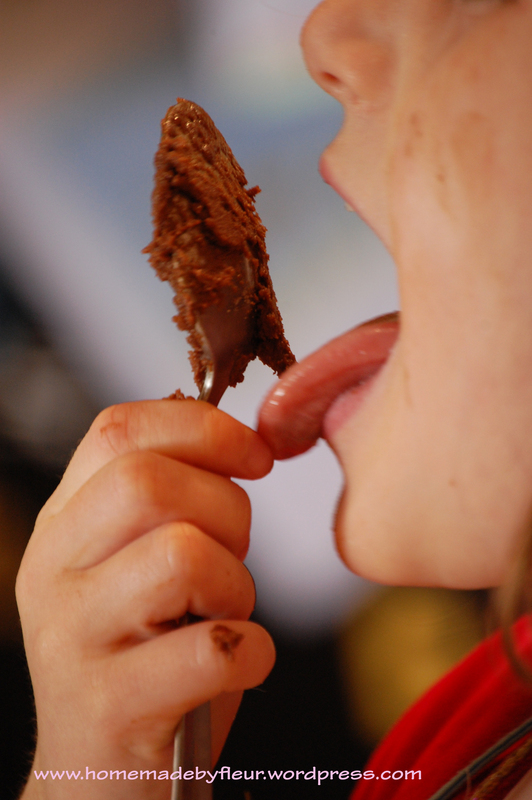 Whilst waiting ALL the spoons were licked…the best part I’m sure! 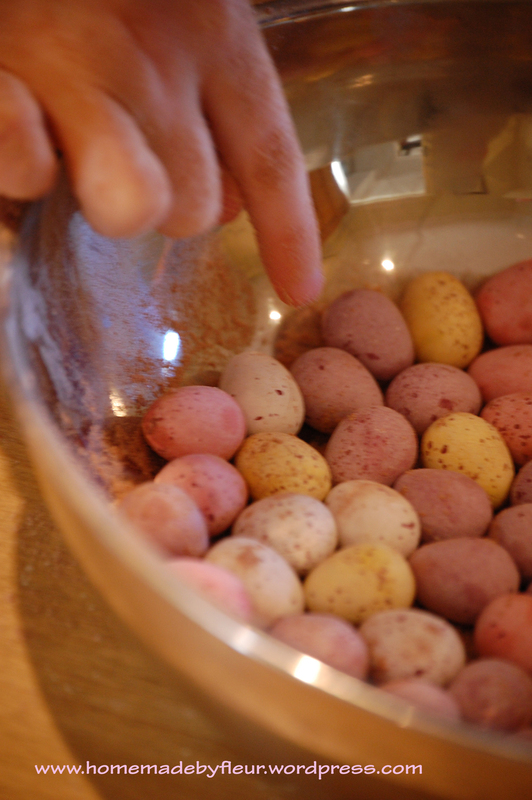 As soon as they come out, the mini eggs go on, another enjoyable part for the girls, and then they are ready to eat. And what a lovely treat they were. 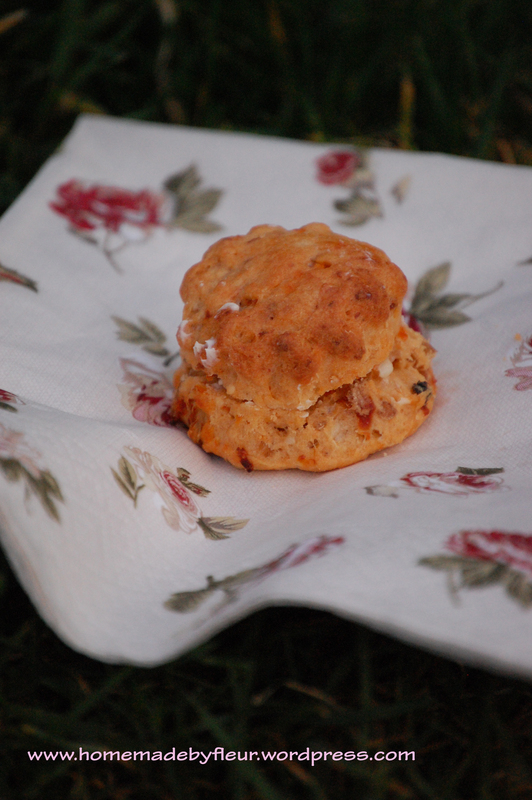 Especially nice still warm and gooey from the oven. It was a super activity and great for me not to have to weigh everything out. If you are looking for an alternative Easter gift this would be a fun option to consider. I might order a job lot and have them on standby for birthday presents. My girls seem to go to a party almost every weekend! Take a look at the IBaked by Me website to see the whole range. 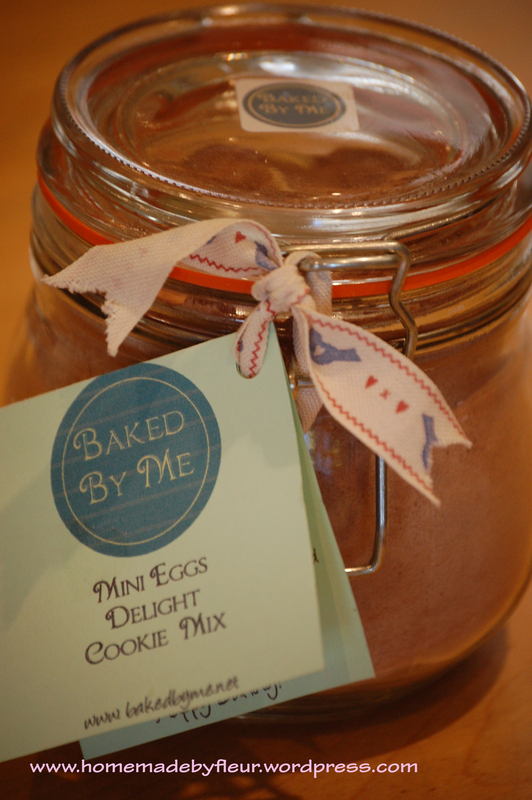 The cost for a cookie mix jar from Baked By Me is between £8.80 and £9.80. I wish Iris all the best with her new venture. Disclaimer- I do not work for Baked By Me nor did not get paid to write this review. 04/03/2012. Tags: Baked By Me, baking with children, children's activity, chocolate, Easter baking, fun in the kitchen, lick the spoon, mini eggs. 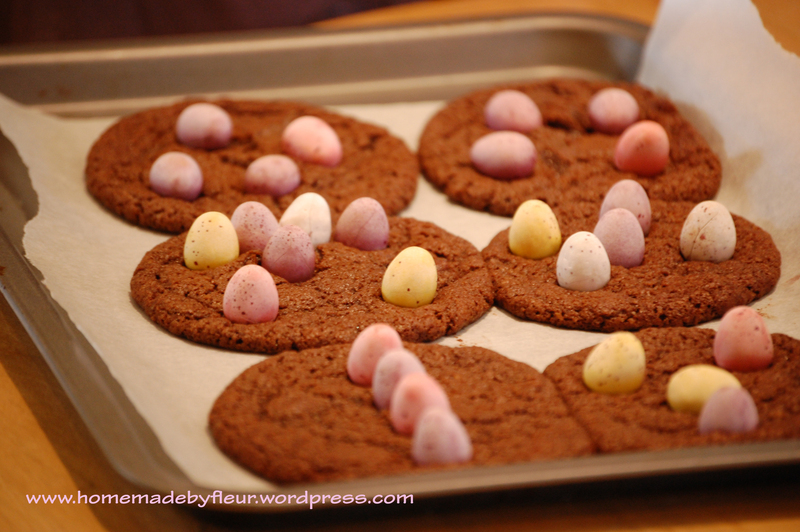 Easter Baking, Homemade for the kids, Homemade with the kids, Reviews, Sweet Baking. 4 comments. This week was very exciting for one main reason. 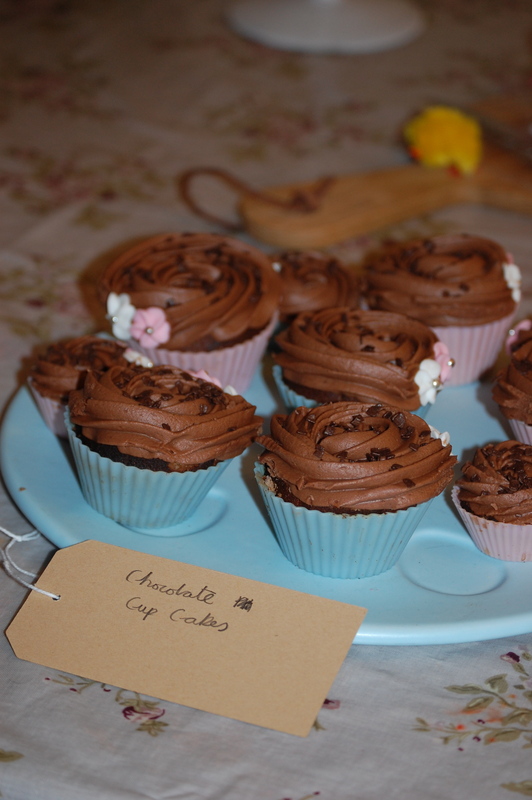 I hosted my first ‘Homemade By You’ Bake Club, (round of applause). I had been thinking about doing this for a few months, so to see the idea become reality was fantastic. 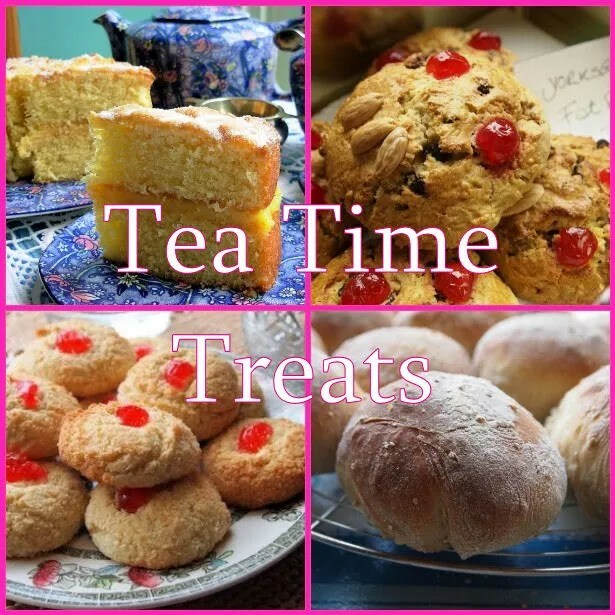 The concept is that members bring along a homemade ‘bake’ of their choice which fits with a monthly theme, (this month was chocolate and spring time) then they share the recipe and any tips with the other members all over a cup of tea and a slice of cake. My thinking was that people would enjoy a reason to bake. As I mentioned in my previous cake therapy post, this is something I actually look for and I was sure I would not be the only one. 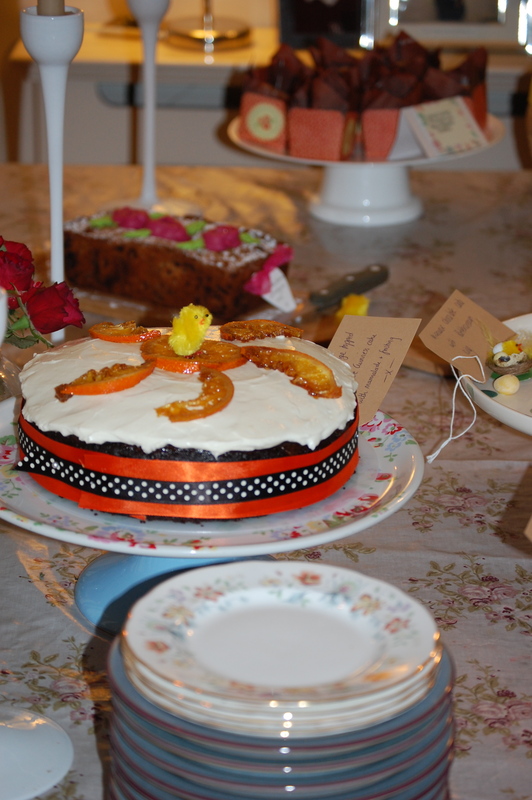 I also hoped that by bringing people together who share the same passion there would be lots of happy cake chatter, and hopefully some new friendships too. I know my husband gets very bored of me talking about baking and all the ideas I have, so he for one was very keen on the idea of a bake club. 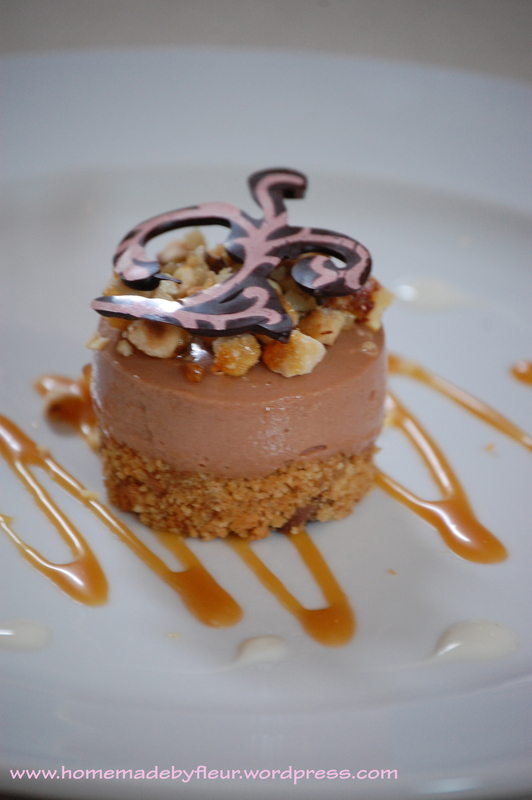 French style chocolate gateaux cooked in the microwave. A revelation to most of us and it was so moist as no chance of drying out in the oven. Lemon, white chocolate and black pepper muffins. A new and gorgeous flavour combination. Mini chocolate cheesecakes cut out from a big cheesecake by using a round cookie cutter. Chocolate Easter fridge cake which had all manor of delightful ingredients including crushed mini eggs in the cake…superb! Chocolate Guinness cake with marmalade and cream cheese frosting. This cake looked and tasted amazing, and being Irish myself I fully approved of the addition of Guinness. Chocolate, banana and honeycomb loaf cake. My offering using the lovely Cakeboule’s recipe. Not much of this left at the end of the night, so must have been good. Be quick! Places are limited and will be booked on a first come first served basis. Booking: Please email me at homemadebyfleur@gmail.com to register interest and further details will be sent to you nearer the time. 02/03/2012. Tags: Bake Club, chocolate cheesecake, chocolate guinness cake, chocolate microwave cake, homemade by you, lemon, new friends, white chocolate and black pepper muffins. Bake Club, Sweet Baking. 11 comments.